In my line of work, there is a very thin line between personal and professional. The word ‘human’ in ‘human rights filmmaking’ denotes something inherently personal. So does the word ‘social’ in ‘social justice’. Our trip to Kenya was a prime example. Girl Connected is an interwoven story of five teenage girls who are examples to their peers in battling gender discrimination. 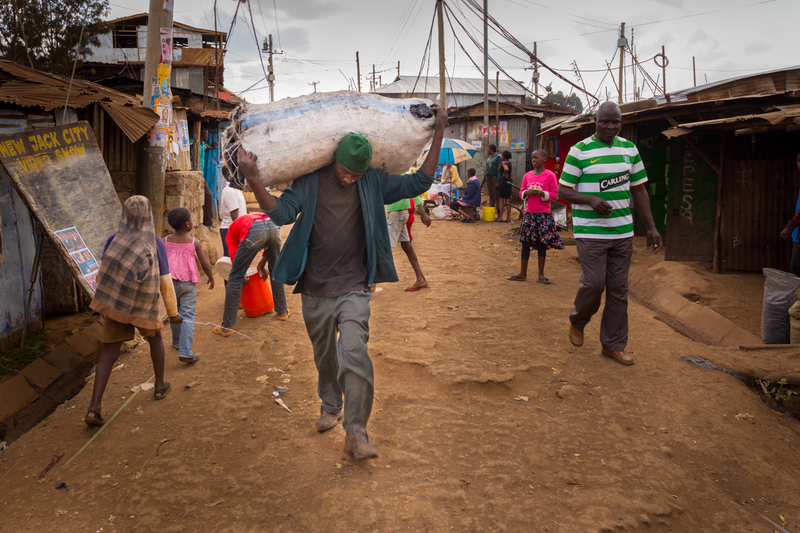 While in Nairobi, we had the privilege of following 19-year old Michelle Buyaki for a week – a professional assignment that turned into the warmest and most memorable of personal experiences. Michelle is one of very few women in Kenya to study aeronautical engineering. 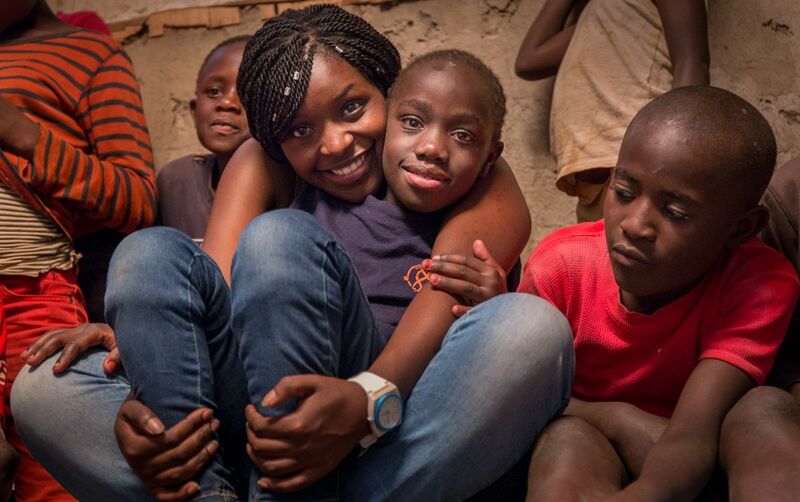 In her free time, she runs her own foundation that works with teenage girls in Kibera, Africa’s largest slum. There, we were able to capture her during one of the foundation’s activity days. Along with a team of friends and family members, she trains young women in becoming self-reliant. This not only involves teaching practical skills with which they can make a living (sewing, bakery, pottery, etc.) but the foundation also offers a mentorship program that emphasizes the importance of role models. Last but certainly not least, she encourages the girls to give back to their own community. Michelle is from a very humble background. After spending the first 18 years of her life living in a home made of tin sheeting, her family of eight now shares a two-bedroom 450 sq. feet apartment in a housing estate in central Nairobi. Once you get to know Michelle’s family: her mother and father, her aunt Vanessa, her grandmother and her siblings, you start to understand where goodness in people is born. Not only were they very pleased for their daughter to be part of the documentary project, but they also seemed extremely honored to make our acquaintance. As a result, we always had to allow for extra time in our schedule to simply pick Michelle up from her home in the mornings, because there was no way we could leave the house without having been offered a sign of their hospitality. Similarly, we had to promise repeatedly to come by for dinner on Sunday – an offer we gladly accepted. This time without the camera, obviously. I don’t often have dinner at the homes of my protagonists. Since I work a lot in the area of women’s rights in the realm of poverty, I don’t feel it appropriate that – on top of me taking valuable time from them while filming – they would also have to cook for me. But with Michelle, it was different. 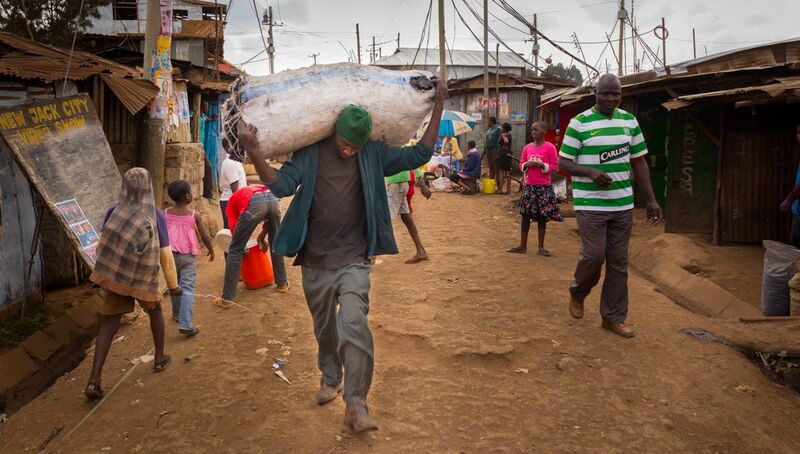 There was no way they would let us leave without having tried their home-cooked Kenyan food. The appointment turned out to become a memorable one with many of her family members gathering for the occasion. Michelle’s mother had been cooking for the entire day, and some 15 dishes were spread out over two crowded tables. Everything had to be tasted and was delicious. There was meat, chicken, fish, vegetables… it was all delicious. Then the members got up one by one, introduced themselves and talked about the cohesion in their family. They thanked us many times for being there, and compared our visit to the one Obama had recently honored their country with. Finally, it was our turn to talk. As the film’s producer-director, I felt compelled to talk on behalf of both Tjodi and myself. I said a few words about how humbled we were with their hospitality, made them laugh once or twice and thanked them a thousand times – thinking that was enough and that, after a family prayer, the evening would be winding down. But it was not over yet. Despite me speaking for the crew and everyone else already having had their turn, they insisted that Tjodi had the final word. Tjodi doesn’t like to talk. She is the sound recordist and hence, prefers to listen. I saw her struggle for just a moment. Then, she pulled out her phone, found a Dutch song on it and declared that, instead of her doing a little speech, we should all dance. Michelle was the first one. With her encouragement, little by little everyone got up to move his or her hips. In the end, even their fragile grandmother was on her feet and started swinging. In a space no larger than eight by twelve sq. feet, between three sofa’s and two low tables, with the song barely audible, there were 15 people moving in the same rhythm, laughing, taking each other’s hands and for those five minutes, becoming one. On the way back to the hotel that evening in the back of our car, we were speechless. With our extensive combined travelling experience, only a few times before had we encountered the kind of hospitality and warmth that we were able to enjoy that evening. And it was then, that I thought again about one of the major perks of my job – the fact that social justice filmmaking is indeed a very personal experience. The human level of it cannot be ‘switched off’ once the camera has been put away. And that the significance of the professional aspect of my job, driven by the richness of the personal experience, is what inspires me time and again to tell the stories I try to tell.